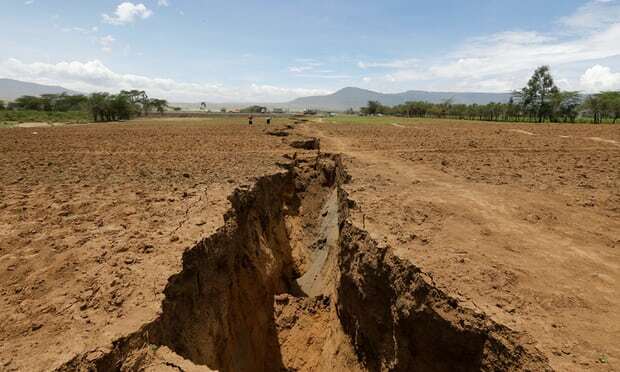 Global media outlets have been abuzz recently about a large “crack” which appeared in the Kenyan Rift Valley. Many of these news pieces have tried to get to the bottom of what caused this feature, with many reports concluding that it was evidence for the African continent actively splitting into two. However, many articles cited limited expert comment, much of which was taken out of context and was based on minimal hard evidence. Other articles fed directly off previous reports, propagating unsubstantiated rumours and losing sight of original sources. Given the initial appearance of the crack, the reports of earthquakes apparently occurring at the same time, and its location along a newly-forming tectonic plate boundary, it is perhaps natural to quickly think that this is related to the break-up, or “rifting”, of Africa. Since the sudden appearance of the crack may understandably affect the lives of those locals living and working in the vicinity, it is important that we look at all the available evidence to find out what is causing it, and to prevent undue panic. First, looking at the numerous images and videos of the feature, it is clear that it does not have a tectonic origin. The two sides of the crack do not have the same outline, and much like trying to fit two pieces of a puzzle together, they do not join. Also, the crack is not fully continuous, with soil “bridges” in between. There are also no clear escarpments and the land is flat on either side of the crack. These lines of evidence show that the crack was formed by sudden erosion – not by pulling apart (extension) along active geological faults. Second, reports of seismic activity are unsubstantiated. There have been no official reports of earthquakes from authorities within Kenya, and we can say with certainty that no moderate-to-large sized earthquakes have occurred recently. With Kenya’s capital, Nairobi less than 50km away, even small earthquakes would have been widely felt. Even so, since the entire region is undergoing gradual extension, it is normal for small earthquakes to occasionally occur across the region, so local people feeling tremors does not suggest any causal abnormality. Discrete rifting events and the gradual formation of depressions have been seen before in the part of the East Africa Rift that continues north through Ethiopia, causing strong (magnitude 5+) earthquakes, detected thousands of kilometres away. These events were caused by movement of hot molten rock deep within the crust, known as magmatic dyke intrusions, forming brand new crust. The intrusions using satellite radar measurements, which showed buckling of the crust over broad areas tens of kilometres wide surrounding the surface crack. Similar that has looked for ground movement in the region of the new crack in Kenya over the past few weeks does not show any such large-scale deformation. This result shows there has been no deep movement of magma allowing the crack to form. Given the evidence available at present, the best and simplest explanation is that this crack was in fact formed by erosion of soil beneath the surface due to recent heavy rains in Kenya. A indicates that similar erosional features can be seen elsewhere in the region suggesting that these flash flood events have caused erosion before. This agrees with what and – rainwater has washed away deep layers of loose volcanic ash deposited by previous volcanic eruptions in the rift valley. Similar erosional features have in tectonically stable regions, such as Arizona. Given this conclusion, it is fittingly less dramatic to refer to this feature as a gully. The location of the loose ash layers and the underlying, long-lived structure of the East Africa Rift may have played at best a very tenuous and indirect role in the formation of the gully. Yet, for more genuine and arguably more spectacular evidence of Africa slowly splitting apart – at a rate of less than 1cm/year – we can look to the giant escarpments and numerous volcanoes all along the East Africa Rift, from recent eruptions at Mt Nyiragongo in the Democratic Republic of the Congo to the bubbling lava lake of Erta-Ale in Ethiopia, which has a 16 km long lava flow. There is much ongoing scientific research in the East Africa Rift, with projects such as the UK-based RiftVolc initiative likely to produce some exciting results in the near future.